We are so excited about our new lines of high end wireless speakers , wireless subwoofers and other wireless products, we can't hide the news anymore. We showcased some of our pilot wireless subwoofers, wireless digital amplifiers, and wireless receivers & transmitters at the CES show, receiving an awesome response that reconfirmed the direction of our wireless speaker product development . Many people were drawn to our show room by the stupendous sound quality of our New Chopin EX speaker, but when they found out the speakers were driven by wireless digital CD quality signals, the most common response we got was " WOW!" . Our decision to put our displays in the high performance audio speaker section has paid off. Our wireless speakers have a sound quality by no means inferior to any wired high end speakers at the 2004 CES show; but apologies to our own Chopin EX speakers, from which the spotlight been stolen. One gentleman even went so far as to tell us: "I am working for a wireless company, but we've never had anything with such great quality. This going to be BIG!" Another wireless skeptic said: "When my clients ask me about wireless speakers solutions, I always answer 'Don't bother! ', but what I've heard today has changed my mind about wireless speakers!" You can view the pictures of wireless products at 2004 CES Show Highlights. These applications utilize state of the art digital wireless Technology & Science combined with highly efficient super compact speakers amplifiers that provide a performance good enough to satisfy audiophiles. This wireless amplifier can provides enough output ( 160-watts / 4 ohm, 100-watts / 8 ohm ) to drive your high end speakers into wireless speakers. This wireless compact amplifier is developed to fit inside of our high end speakers; it will be part of our high end wireless surround sound & wireless home theater speakers solution. However, we will introduce this wireless amplifier as a stand alone unit first, so people have the option to transform their existing high end speakers into wireless speakers. This also provides various options for installations and other commercial applications. This product combines the non-directional nature of a subwoofer's low frequency with wireless speakers technology, allowing you to literally hide that big square box anywhere in the room. We are considering sellimg the speakers control panel as a separated unit from our wireless subwoofers, so people have the option to build their own wireless subwoofers. Wireless speakers amplifier with 200 Watts/ 4 ohms output, continuously adjustable in sound level, phase and frequency. Switchable in low pass frequency (40, 80 Hz). A/C 115, Auto-Detect On/Off switch. Continuously variable crossover frequency from 40-180 Hz. 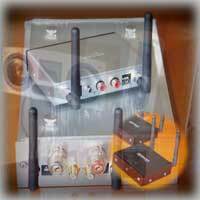 Connect this product to your audio equipment & Speakers for CD quality digital wireless signals. This external wireless receiver & transmitter is developed to give the greatest flexibility to transmitting CD quality wireless signals from source to source. Check back often; we will keep you updated. To ensure you won't miss any new products updates, subscribe to our newsletter HERE.